The vast majority of visitors to Alaska arrive on large cruise ships that offer plenty of entertainment on-board, but don't offer too much in the way of truly experiencing the beauty and wilderness of Alaska. Google the phrase "Luxury Alaskan Cruises" and you will be bombarded with options. Be careful! Not all cruises are created equal. If you choose to go with one of the large ship cruise liners, you may be packed in with the masses, forced to eat the same meals as everyone else, and then gouged by extra fees and extravagant excursion costs. Alaska small ship cruises are different. Our trips are all-inclusive and completely customizable; everything from the menu to the day's agenda is up to you. If you want to lounge in our cabin all morning and kayak all afternoon, you can. If you want to bird watch from 5 am until the last rays of light fade over the Inside Passage, you can. Whether you want to wear yourself out hiking or simply relax in the hot springs, it is entirely up to you. 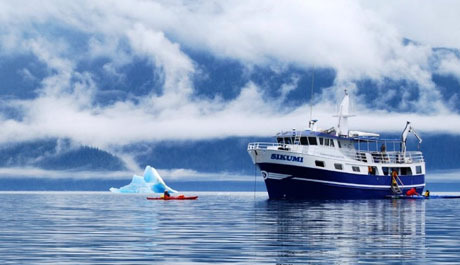 Aboard the Sikumi you can enjoy the luxuries of true spontaneity, an adventure that is all your own, and exceptional service that only the Alaskan spirit can give you. There is a big difference between Alaska Small Ship cruises and Large Cruise liners. Why Choose A Small Luxury Cruise Ship? No matter what kind of traveler you are, choosing one of the small luxury cruise ships of the Inside Passage might be just the thing you are looking for. Here are just a few reasons why traveling on a ship like the Sikumi might be just right for you. The Luxury Traveler: You will feel pampered and relaxed as you explore the beauty of the Inside Passage. Our ship gives you a private experience that is unparalleled. Family Vacationers: You can book our entire ship or just one room. Our ship is renowned for family gatherings and offers amenities for everyone from small children to grandparents. We can even help you put a smile on the face of that grumpy teenager. Local Connoisseurs: Are you a traveler who loves staying at bed and breakfasts, eating at local restaurants and experiencing each place's unique culture? Then the Sikumi is just for you. We are locally owned and operated, we love preparing fresh local specialties, and will personally guide you through the Inside Passage's best. Small boat cruising allows you to get into parts of Alaska's Inside Passage that very few, if any people have ever stepped, kayaked or fished. 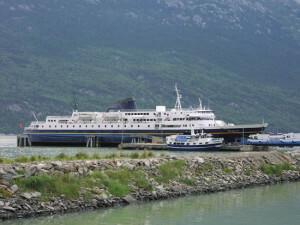 With Custom Alaska Cruises, the small ship M.V. 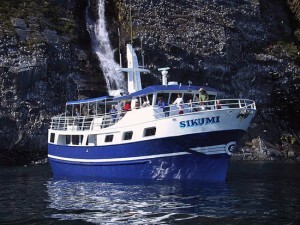 Sikumi gives her passengers an up-close look and intimate experience with the state of Alaska. Without a doubt, cruising aboard the M.V. Sikumi is a completely personalized experience. From planning to cruising, Custom Alaska Cruises collaborates with you to make sure you get exactly what you want out of your cruise. Small ship guests know that there is a much better way to truly experience their surroundings than onboard a mega-ship. Many of the large ships that cruise Alaska's waters carry over 3,000 passengers. 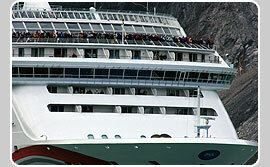 The immense size of the ship and huge number of passengers greatly reduces the Alaskan experience for visitors. Our four staterooms provide comfortable and cozy accommodations for 8-10 (max 12) passengers, ensuring a personal and intimate Alaskan experience. 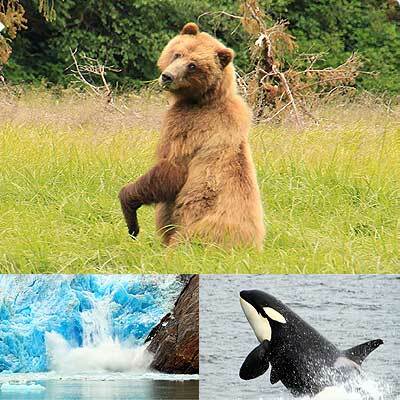 The diverse and exotic wildlife of central and southeast Alaska is one of a kind. The intimate atmosphere of the small cruise ship "M.V. Sikumi" is an ideal way to get up close and personal with wildlife, whether we find a good fishing hole for our guests or visit a beach that is frequented by bears. 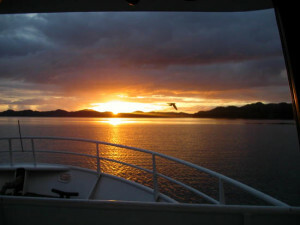 Whale, porpoise and sea otter sightings are also a common occurrence aboard the Sikumi. Enjoy fine dining as our chef will prepare the fresh catches of the day. Our guests enjoy fishing for shrimp, halibut and salmon; and one of the highlights of the day is sitting down in the Sikumi's dining room amongst friends and family to enjoy an elegant and intimate dinner. our imagination is the only limitation for what you do on your cruise. The much smaller size of our luxury cruise boat allows for travel into the most remote and inaccessible places in Alaska. From the very early planning stages of your cruise, your wishes and desires are of the utmost importance to us and our crew. We will do everything in our power to make sure your cruise aboard the M.V. Sikumi is one you'll never forget.